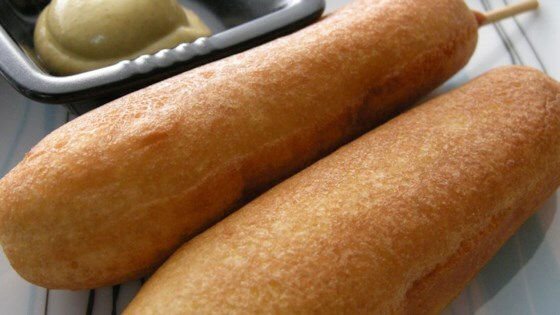 "I made up this recipe many years ago, because I loved the corn dogs you buy at carnivals but could not find a recipe for them. Great served with mustard." Very yummy. I've found that putting the prepared batter in a drinking glass helps ease the process... it's the perfect size tool to batter a hot dog! Wonderful recipe!!! Roll your hotdog in corn starch first. It will prevent your batter from slidding off. Tasted great! My husband was raving!!! Dry the dogs before coating and the batter sticks just fine. YUMMY!